The Mena Palace is located in the central part of Sunny Beach and offers the wealth of facilities and excellent service you would expect from a four star hotel. Rooms are spacious and elegantly furnished. I was a bit worried before I travelled as some comments were a bit off putting, but they were wrong. The hotel is clean, all the staff are very polite and friendly and they speak perfectly good English especially the porters. If there was any noisy holiday makers at night they sorted them out straight away. We got clean towels everyday and made the beds even if you had made them yourself and they were changed twice in the 2 weeks we were there. The only problem was is the food, although you could always find something to eat they need to cater a little bit more for the Brits but then again you are in a foreign country. We will be going back again, so go ahead and book your holiday you will have a good time. If anyone comments about the staff being rude, there is probably a very good reason for it like the customer being rude in the first place. Hotel was cleansed on a continual basis. Hotel food was acceptable and comparable to other four star hotels we have stayed in whilst holidaying in Bulgaria. Hotel is in good location, busy area during the day with pedestrian traffic, quiet at night no disturbance. Hotel is five minutes away from centre, main bus station and the best bars in Sunny beach being the Condor bar and Sharkies. Hotel staff very professional and interact well with hotel guests. Entertainment is a duet every evening, at the pool side bar and their music covers for all tastes, they seem to attract people into the pool bar who are walking by, out for an evening stroll who have a drink whist enjoying the music. All in all, a good friendly, well run hotel, suitable for families and couples. We are returning in June 2011. Just back from a 2 week holiday at Mena Palace Hotel. This is our 3rd visit and I have to say that I think the hotel is now better run than when we first went. The food in the hotel was better than in the restaurants outwith the hotel. The two catering manageresses and their staff did a great job and always with a smile, as did all the staff from Managers, Receptionist to cleaners. Rooms cleaned and fresh towels every day, beds changed every second day - excellent service. No rush for a sunbed at the pool as there were always plenty available, no matter what time you went down. Air con in the room worked a treat. We did miss the presence of Evo who used to run the football bar attached to the hotel - but in saying that the bar staff well all very pleasant and enjoyed a laugh with us. 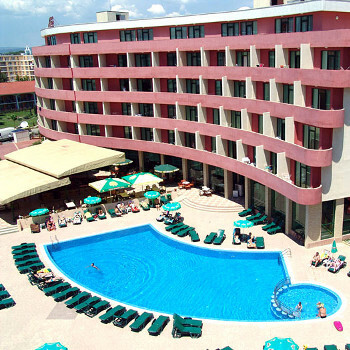 We will definitely be back to Mena Palace - probably one of the best hotels on Sunny Beach! we have been to the Mena palace hotel before and have had nothing to complain of. It is a clean, well run hotel, the staff interact very well with guests. We were on a half board basis and found during our stay the selection and quality of the catering to be on a par with other hotels of a four star rating in Bulgaria. We did not always have an evening meal because we were usually out and about and would eat out, as we tend to use the hotel as a base. The catering manageress has the staff very well organised in providing a courteous and efficient service. The location of the hotel is ideal, it is close to the main bus station from which you can travel to all the outlying cities,towns and villages such as Varna, Bourgas,Nessebar,Pommorie, Vlas etc at very competitive prices. The beach is very near and at night the hotel in its location is surprisingly Quiet. Overall we found the staff to be continually courteous and professional in dealing with any queries and requests. We did not see any signs of organised entertainment. We also did not use the pool facilities, but everyone who did appeared to be very happy with them. What we did notice was, some guests we had seen and spoken to on our previous stay at the hotel had come back again, so if standards are maintained as they are, then they will have people coming back, as we are in September. This is the 4th time we have visted this hotel, it hasnt changed much, the staff are still great. The locaction is good not to far from everything. I wish they had more things for the kids to do. Not sure if i wpold stay there again. Room cleaned everyday although towels and bedding only changed twice in 11 night holiday. Food was disgusting no choice at all and food that was available was awful. I am not fussy but was really disappointed in the food.My 12 year old daughter got fish fingers on the last night that were stale. The location was of the hotel was alright. Found staff to be quite surly and not interested in any complaints or bad behaviour my other holiday makers. I would not visit this hotel again and would urge other holiday makers to think twice before booking to got to this hotel with children as we went the last two weeks in july and it was getting really rowdy with single people who had no consideration for other guests who had children in the pool. One group of holiday makers had a plastic table throwing it around in the shallow end of the pool and it took about twenty minutes before the barman came over to tell them to stop. This was our first visit to Bulgaria and on the whole we all really enjoyed our holiday.Our rooms were fantastic-very spacious and spotlessly clean. There was plently of storage space for our clothes and other belongings. The fridge in the room was great as was the clothes airer on the balcony.All communal ares were also cleaned to a very high standard. We spent most of our time around the pool which again was very clean.Our daughter loved the little play park. The hotel is within easy walking distance of the resorts facilities. Our greatest disappointment was the food and the restaurant in general. The choice of food was limited and trying to find crockery that wasn't chipped was a trial in itself!Cutlery was in short supply too.On the plus side, we found the breakfast acceptable.